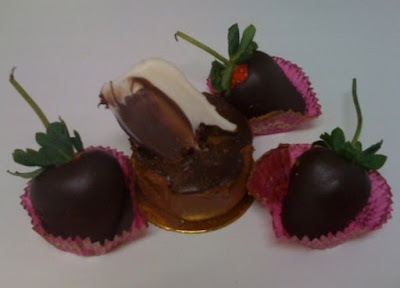 Coqui the Chef: Chocolate covered Strawberries in June! Chocolate covered Strawberries in June! The full moon in June is considered "Strawberry MOON"
This name was universal to every Algonquin tribe. season for harvesting strawberries comes each year during the month of June. Add vegan chocolate or carob chips into a medium heatproof bowl. Fill a medium saucepan with a couple inches of water and bring to boil over medium heat. Turn off heat. Put the bowl of chocolate or carob chips over the water to melt. Stir until smooth. After chocolate or carob chips have melted, remove from heat. Line a sheet pan with unbleached parchment or waxed paper. Hold a strawberry by the stem, dip it into the melted chocolate or carob, lift and twist slightly, letting any excess drip back into the bowl. Lay strawberries on the parchment paper. Repeat with remaining strawberries until all are covered. Optional: Garnish with shredded coconut. Allow chocolate or carob to cool, about 30 minutes. About Julie S. Ong she is the Author of The Everything® Guide to Macrobiotics, she is a certified Natural Chef, Macrobiotic Counselor, and Spiritual Life Coach. A native of San Francisco, California, she received her B.A. in Psychology from the University of California, Berkeley. She is also a graduate of Bauman College, Holistic Nutrition and Culinary Arts in Berkeley, California, and a level four graduate of the Kushi Institute.